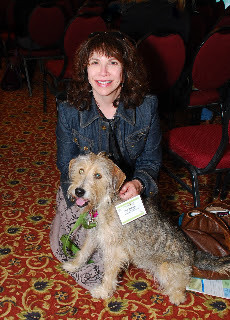 Win A Trip To The Next BlogPaws Conference! Here's a great opportunity to hobnob with your fellow pet lovers and pet writers, and mingle with tons of representatives for the pet products and services industry. And that's all you have to do is enter this fun contest, sponsored by BlogPaws! Check out the contest information right now, you'll be glad you did! Note that the rules are all contained on the Facebook link provided above, but just so you know-that's all you have to do to enter is share a photo of your pet and tell the BlogPaws team why YOU should get to come to the BlogPaws conference-you can even write a short, 50 word essay to accompany your photo, if that's more your style. But you can't win if you don't enter, right? P.S. This is the third BlogPaws conference that we will be privileged to attend...and take it from us-they just keep getting better! We'd love to see you there! we entered too!!! Hope to see you there! So you are going to T.C., VA???? I wish that it was closer. I don't do the FaceBook thingy. Sorry. You are going to have lots of fun there! Really very informative. Keep posting!